A cowboy Pantaleon Godines got a sore in his crotch from scratching the saddle. Since no remedy would help him he entrusted himself to Saint Pancras. The next morning the sore was gone, and he thanks for that. Gilberto Martinez loved when his wife gave him lashes. But one day she got out of hand and gave him hell. He thanks Saint Elias for healing up and promises to control his fetish. Carlos Tepoz wanted to impress a chick by carrying many sacks with fruits but screwed his knees and neck. 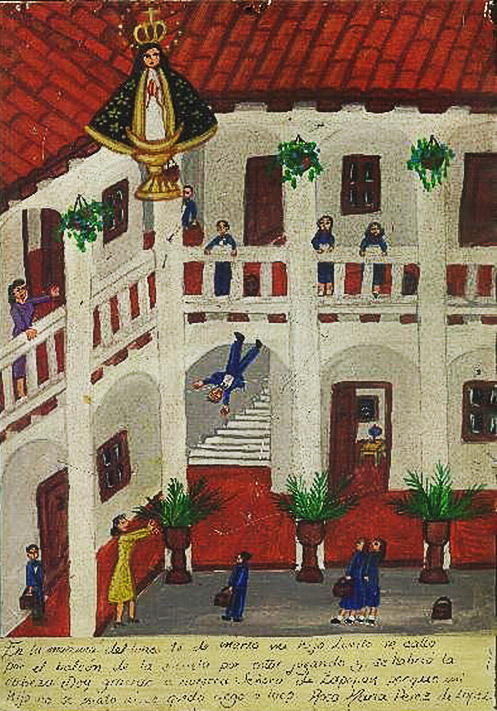 He thanks the Virgin of Juquila for he can walk again, although the broad didn’t pay any attention to him because he’s ugly. 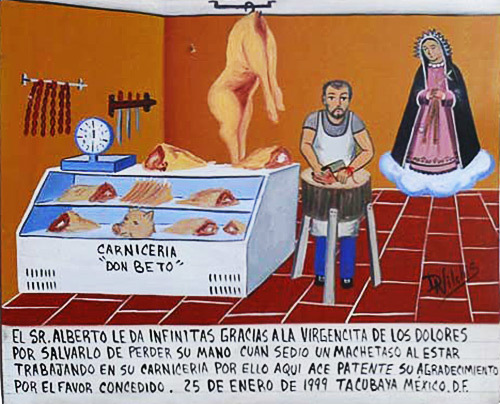 Señor Alberto thanks the Virgin of Sorrows for not losing his arm when he cut himself while butchering meat in his shop. 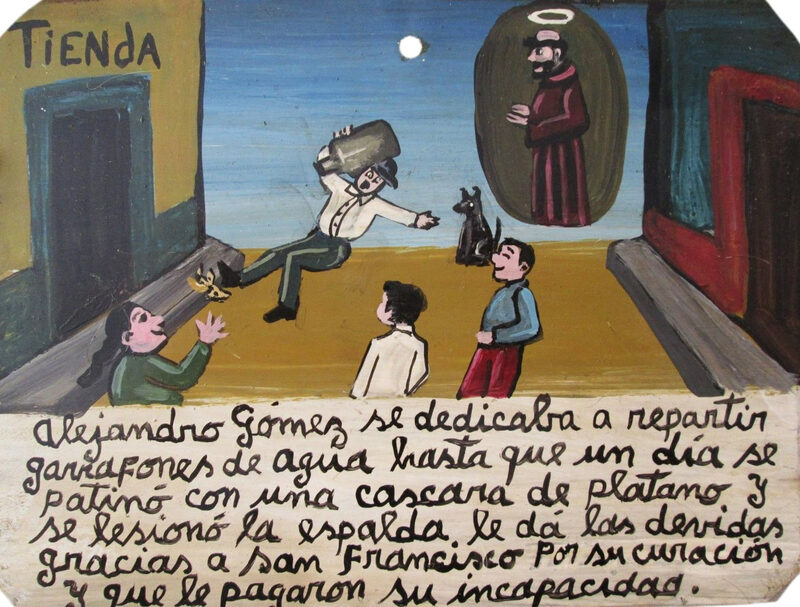 He brings this retablo as his gratitude for this favor. At a volleyball match, Catalino Fernandez hit his coccyx. It was very painful. 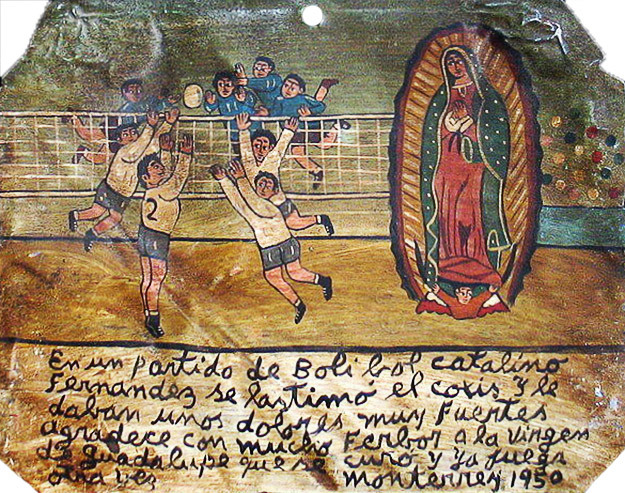 He thank the Virgin of Guadalupe for he’s got healed and is back again to play volleyball. My son Gregorio was slightly crazy. He made himself wings from chicken feathers and jumped off the highest tree. 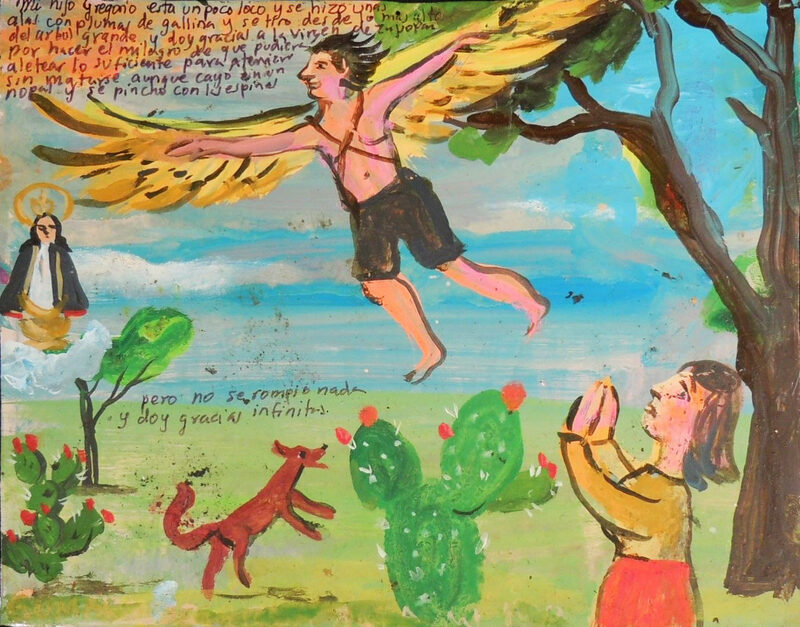 I thank the Virgin of Zapopan for the miracle that he was able to flap his wings a little bit—enough to land without killing himself. Although he fell on a cactus and got hurt by the spines, he didn’t break his bones for which I infinitely thank. 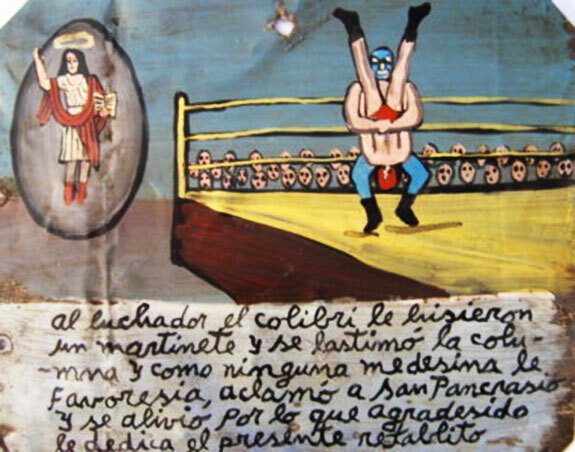 A piledriver move was used against the wrestler El Colibri. His spine was injured. Since no medicine would help him, he implored Saint Pancras and recovered. 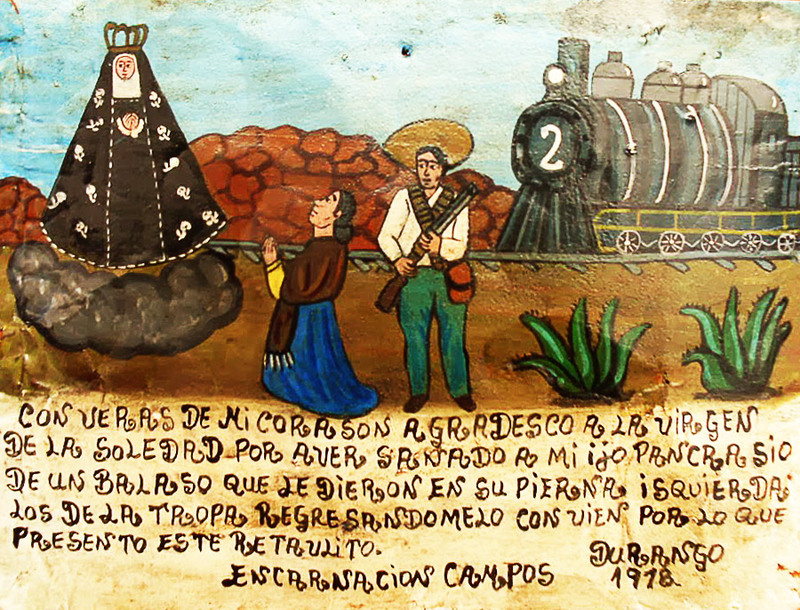 He dedicates the present retablo as gratitude. With all my heart, I thank the Virgin of the Solitude for curing my son Pancrasio. He got a bullet in his left leg during a shooting with the troops. 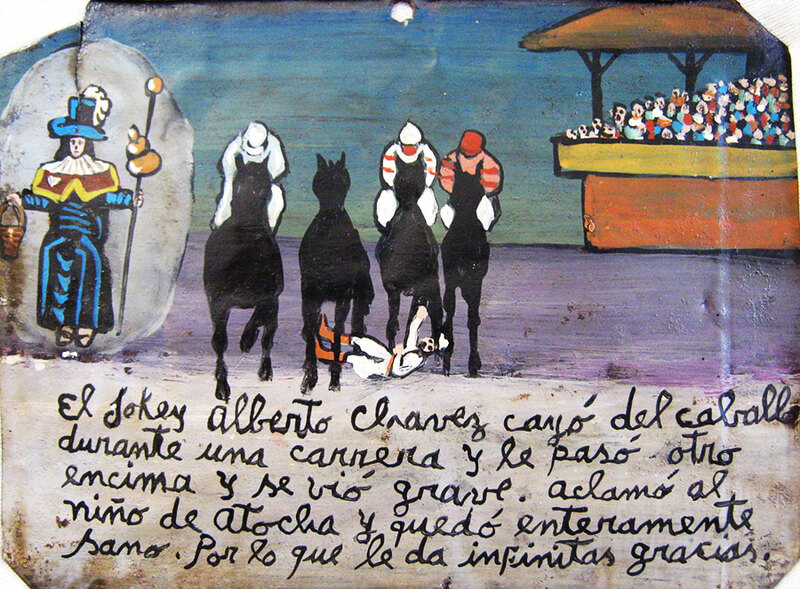 I thank with this retablo for he’s alright now. Morning of March 16, my son Luisito was playing and fell of the school balcony. He hit his head. I thank the Virgin of Zapopan he’s alright, he didn’t became blind or idiot. In times of the Revolution I was part of the Federal Army but my troops lost a battle, I was badly wounded and was on the edge of dying. 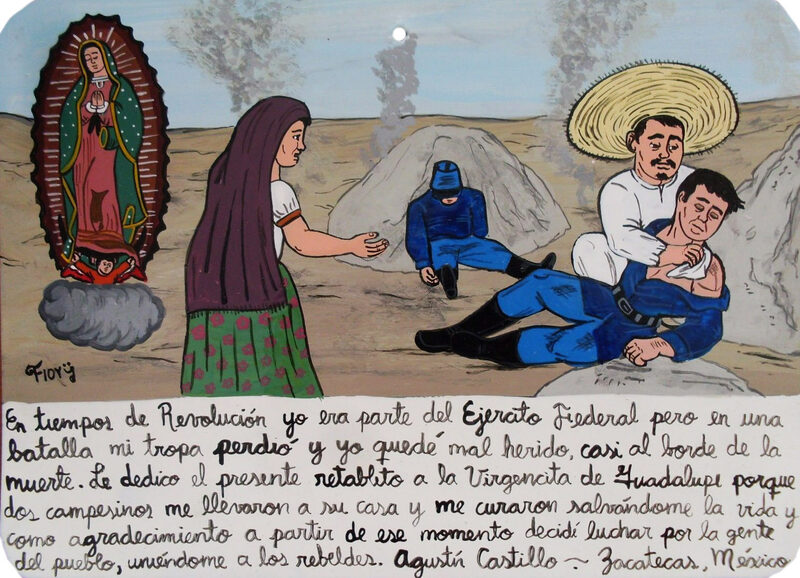 I dedicate this retablo to the Virgin of Guadalupe because two peasants took me to their home. The cured me and saved my life. In gratitude I decide to fight for the people since that moment and joined the rebels. 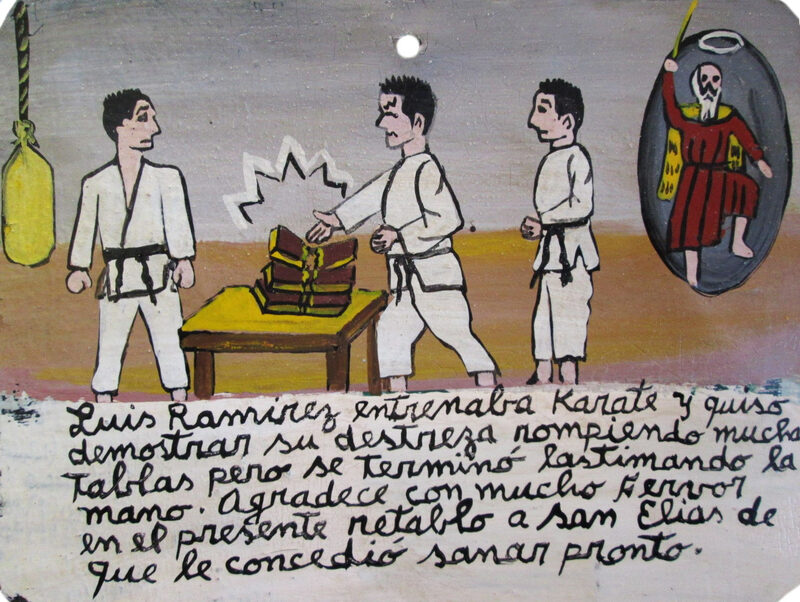 Luis Ramirez taught karate. He wanted to show his skills by breaking many boards but ended up injuring his hand instead. 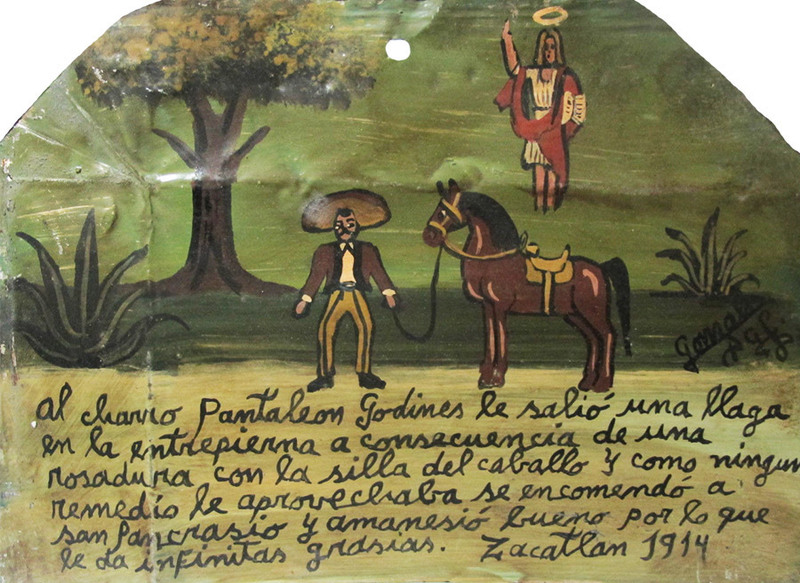 He thanks Saint Elias with the present retablo for his hand healed quickly.